Doctor of Philosophy Valery Dyemin, a researcher of the Arctic region, maintains that Hyperborea (“beyond the Boreas (north wind)”), a mythical land that the Greeks thought was located beyond Scythia, existed in reality. 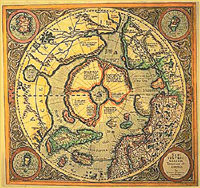 The legendary French scientist Jean Sylvin Baiae attempted to prove the existence of Hyperborea a few centuries ago. “I believe we should be looking for the traces of that civilization in Eurasia and American arctic regions, in the islands and archipelagos of the Arctic Oceans, at the bottom of some seas, lakes and rivers. It’s worthy of notice that Russia has the largest number of locations and artifacts that could be bear relevance to Hyperborea. Some of the above have already drawn attention of specialists; others are yet to be discovered. Active exploration is currently under way in the Kola Peninsula, in the Island of Vaigach, in Karelia, Ural Mountains, West Siberia, Khakasia, Yakutia, and a few other regions. There are good prospects for conducting research in Franz Josef Land, Taimyr, and Yamal.